Styles and themes on Android allow you to separate the details of your app design from the UI structure and behavior, similar to stylesheets in web design. A style is a collection of attributes that specify the appearance for a single View. A style can specify attributes such as font color, font size, background color, and much more. A theme is a type of style that's applied to an entire app, activity, or view hierarchy—not just an individual view. When you apply your style as a theme, every view in the app or activity applies each style attribute that it supports. Themes can also apply styles to non-view elements, such as the status bar and window background. Styles and themes are declared in a style resource file in res/values/, usually named styles.xml. Add a <style> element with a name that uniquely identifies the style. Add an <item> element for each style attribute you want to define. The name in each item specifies an attribute you would otherwise use as an XML attribute in your layout. The value in the <item> element is the value for that attribute. Each attribute specified in the style is applied to that view if the view accepts it. The view simply ignores any attributes that it does not accept. Note: Only the element to which you add the style attribute receives those style attributes—any child views do not apply the styles. 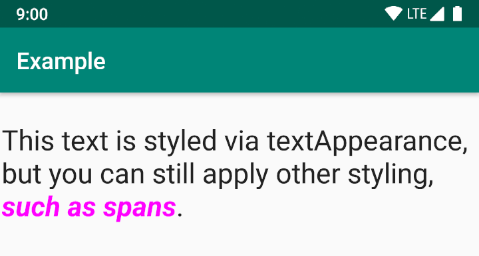 If you want child views to inherit styles, instead apply the style with the android:theme attribute. However, instead of applying a style to individual views, you'll usually apply styles as a theme for your entire app, activity, or collection of views. When creating your own styles, you should always extend an existing style from the framework or support library so that you maintain compatibility with platform UI styles. To extend a style, specify the style you want to extend with the parent attribute. You can then override the inherited style attributes and add new ones. However, you should always inherit your core app styles from the Android Support Library. The styles in the support library provide compatibility with Android 4.0 (API level 14) and higher by optimizing each style for the UI attributes available in each version. The support library styles often have a name similar to the style from the platform, but with AppCompat included. You can continue inheriting styles like this as many times as you'd like by chaining on more names. Note: If you use the dot notation to extend a style, and you also include the parent attribute, then the parent styles override any styles inheritted through the dot notation. To find which attributes you can declare with an <item> tag, refer to the "XML attributes" table in the various class references. All views support XML attributes from the base View class, and many views add their own special attributes. For example, the TextView XML attributes includes the android:inputType attribute that you can apply to a text view that receives input, such as an EditText widget. You can create a theme the same way you create styles. The difference is how you apply it: instead of applying a style with the style attribute on a view, you apply a theme with the android:theme attribute on either the <application> tag or an <activity> tag in the AndroidManifest.xml file. Now every view in the app or activity applies the styles defined in the given theme. If a view supports only some of the attributes declared in the style, then it applies only those attributes and ignores the ones it does not support. Beginning with Android 5.0 (API level 21) and Android Support Library v22.1, you can also specify the android:theme attribute to a view in your layout file. This modifies the theme for that view and any child views, which is useful for altering theme color palettes in a specific portion of your interface. The previous examples show how to apply a theme such as Theme.AppCompat that's supplied by the Android Support Library. But you'll usually want to customize the theme to fit your app's brand. The best way to do so is to extend these styles from the support library and override some of the attributes, as described in the next section. Android provides a variety of ways to set attributes throughout your Android app. For example, you can set attributes directly in a layout, you can apply a style to a view, you can apply a theme to a layout, and you can even set attributes programmatically. Figure 2. Styling from a span overrides styling from a textAppearance. If you’re trying to style your app and not seeing the results you expect, it's likely that other styling is overriding your changes. For example, if you apply a theme to your app, along with a style to an individual View, the style attributes would override any matching theme attributes for that View. Note, however, that any theme attributes that aren't overridden by the style are still used. TextAppearance allows you to define text-specific styling while leaving a View’s style available for other uses. Note, however, that if you define any text attributes directly on the View or in a style, those values would override the TextAppearance values. TextAppearance supports a subset of styling attributes that TextView offers. For the full attribute list, see TextAppearance. Some common TextView attributes not included are lineHeight[Multiplier|Extra], lines, breakStrategy, and hyphenationFrequency. TextAppearance works at the character level and not the paragraph level, so attributes that affect the entire layout are not supported. When you create a project with Android Studio, it applies a material design theme to your app by default, as defined in your project's styles.xml file. This AppTheme style extends a theme from the support library and includes overrides for color attributes that are used by key UI elements, such as the app bar and the floating action button (if used). So you can quickly customize your app's color design by updating the provided colors. Notice that the style values are actually references to other color resources, defined in the project's res/values/colors.xml file. So that's the file you should edit to change the colors. But before you start changing these colors, preview your colors with the Material Color Tool. This tool helps you pick colors from the material palette and preview how they'll look in an app. For a list of attributes you can use in your theme, see the table of attributes at R.styleable.Theme. And when adding styles for the views in your layout, you can also find attributes by looking at the "XML attributes" table in the view class references. For example, all views support XML attributes from the base View class. Most attributes are applied to specific types of views, and some apply to all views. However, some theme attributes listed at R.styleable.Theme apply to the activity window, not the views in the layout. For example, windowBackground changes the window background and windowEnterTransition defines a transition animation to use when the activity starts (for details, see Start an Activity with an Animation). Note: Attribute names from the support library do not use the android: prefix. That's used only for attributes from the Android framework. There are also different themes available from the support library that you might want to extend instead of the ones shown above. The best place to see the available themes is the library's themes.xml file. Because the styles in the values/styles.xml file are available for all versions, your themes in values-v21/styles.xml can inherit them. As such, you can avoid duplicating styles by beginning with a "base" theme and then extending it in your version-specific styles. Now you can apply AppTheme in your manifest file and the system selects the styles available for each system version. For more information about using alternative resources for different devices, read Providing Resources. You can also extend widget styles, just like extending any other style, and then apply your custom widget style in your layout or in your theme. To discover all of the alternative widget styles available from the support library, look at the R.style reference for fields that begin with Widget. (Ignore the styles that begin with Base_Widget.) Remember to replace all underscores with periods when using the style name in your resources.